Enlisted Auctions does not have “cookie cutter” formula that is applied to each auction. Instead, we choose to look at each situation and create a package based around your needs and goals. Enlisted Auctions offers many different services, including moving, trash removal, cleaning, etc. In many cases, we can create a comprehensive package that includes all the services required in simple agreement. The consultation is free and has no obligation. Can I put a minimum bid on my items? Every item on the website has a starting bid of $5. Enlisted Auctions rarely offers the option for a reserve price. Over 99% of the items that are listed on the website sell with no reserve or minimum bid. We may consider an undisclosed reserve on high-dollar assets (vehicles, real estate, etc.). How do I consign items to sell? The process is simple. The first step is a phone call 540-337-3446. We will ask you to briefly describe your situation and items that you would like to sell. We may or may not recommend a free consultation. Enlisted Auctions can come pickup your items or you can bring them to us. Is there anything you don’t sell? Enlisted Auctions avoids selling spouses and children. Just kidding, of course. There are items that hold very little or no value. We take each item on a case by case basis. We welcome a call or email to discuss your items in question. We do provide a removal service that can handle the donation or disposal of items. Of course! We welcome you to come see our galleries and meet our staff. The main office location is 2177 Tinkling Spring Rd., Stuarts Draft, VA 24477. This office is typically staffed from 8 AM to 4 PM Monday - Friday. We recommend calling or emailing before coming to ensure staff are on the premises. How do you set the Buy Now prices? Our team is experienced in a wide range of assets, using past experience and other international resources. We welcome your feedback on the Buy Now price(s) if you are unsatisfied with the value assigned by our team. The buyer’s premium is a 10% added to the final bid of each item. This fee is added to help us keep the commission rates at a level that encourages the seller to consign better quality and more items for your bidding pleasure. Please keep this fee in mind when placing your bids. How do I know when and where to get my items? The first item in each auction, Lot #0, will include all the information needed for the pickup location times. Each auction has a unique location. The auction location and pickup times will also be noted on your emailed invoice. Why do you have limited pickup hours? The logistics and cost of paying staff members to wait for an entire day or week for buyers would drive the cost of business much higher. We will do our best accommodate your needs if there is a reason you cannot pickup your items during the designated times. There may be an additional fee associate with a special pickup request. Why do you extend the bidding on some items? The bidding extension is an automated feature on the website. The purpose of the extended bidding is to allow you to submit a competing bid if another buyer outbids you as the time is nearly expired. The bidding time extension may differ from auction to auction, depending on the asset. What does the Buy Now price mean? The "Buy Now" items offer an opportunity for buyers to purchase an item immediately without waiting for the bidding to end. This item may be sold at any time for the "Buy Now" price, as long as the feature is available. Why did the Buy Now feature disappear? The “Buy Now” feature will no longer be available if the bidding reaches or exceeds 75% of the “Buy Now” price or in the last 24 hours the item is available for bidding. Once the “Buy Now” option disappears, buyers must bid on the item to purchase. A group closing is used when similar items or items of a set are sold in separate lots. The group is identified by an annotation in the top right of the item listing. Item in the same group will all extend if any of the items in that group receive a bid as the time closes. This allows a buyer the opportunity to purchase the entire set or group, or purchase only one item in the group. Items that are nearly identical may use the same photo. Enlisted Auctions recommends attending the preview for any auction to see each item and make your own determination of condition and value. Do you measure every piece of furniture? Enlisted Auctions tries to make each buying experience as easy as possible. We will take a photo of the measurements on most of the furniture we sell. Please call or email if you have any questions about the dimensions of a specific piece. Can I bid as a tax-exempt buyer? Yes! We will need to have a valid and signed ST-10 Virginia Sales and Use Tax Certificate of Exemption on file. You can email or snail mail a signed copy to the office. Do you test items (electronics, tools, ect)? Enlisted Auctions does not test or guarantee the functionality of any item. All items are sold “as-is”. However, we welcome you to attend the preview and test the items. The items will be available for inspection and testing during the noted “Preview” time in Lot #0 of each auction. The payment for your items will be through a credit / debit card. 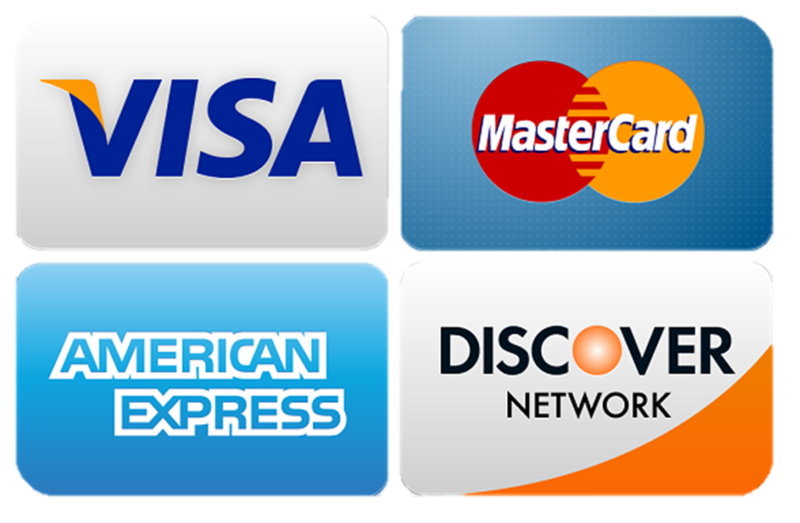 The credit cards accepted are Visa, MasterCard, and Discover. The payment can be made through automatic debit of the saved credit card or by paying when you pick-up your items. Enlisted Auctions will also accept cash or qualified checks. Why was my credit card charge automatically? The online marketplaces throughout the world (eBay, Amazon, Walmart, etc) use this feature to help reduce the hassle of online buying. Our system is no different. We want your buying experience to be easy, fun, and hassle-free. Your credit card information is securely saved on the same servers that are used by Wall Street. If you wish to remove the credit card information from your account, feel free to call or email anytime. The updated credit card information can be made by logging into your account and selecting the "Edit Account" option under the menu in the top right (3 lines). Select "Update Payment Information" to enter your new card info. Can I schedule a different time to pick up my items? Yes, we can make special arrangements for you to pick up your items. There will be additional charges that apply for this convenience (note our convenience fee policy). Please call or email for a confirmation and / or quote for your specific needs. How many DQ Blizzards does it take to have the alternate pickup fee waived? If you talk to Kervin, he’ll do it for a mini Blizzard. Victor isn’t quite as easily convinced, but he caves pretty quickly. Thanks for all the hard work you and your staff put in to make the auction a success. I was amazed at the empty “broom swept” store when I visited yesterday. It was definitely bittersweet. Thanks again and if I can ever recommend your services, I most wholeheartedly will!! !